Director – John Brahm, Screenplay – Barré Lyndon, Based on the Novel by Marie Belloc Lowndes, Producer – Robert Bassler, Photography (b&w) – Lucien Ballard, Music – Hugo Friedhofer, Music Director – Emil Newman, Photographic Effects – Fred Sersen, Art Direction – James Basevi & John Ewing. Production Company – 20th Century Fox. London during the height of the Jack the Ripper murders. Robert and Ellen Burton rent out rooms to the mysterious Mr Slade. They soon find Slade’s activities suspicious – conducting mysterious medical experiments, going for walks at night with a black leather bag just like the Ripper is supposed to carry – and begin to wonder if Slade might be The Ripper. Slade then develops an attachment to their niece Kitty Langley who is a showgirl just like all the Ripper’s victims. The Lodger is a classic psycho-thriller from the 1940s. It was a remake of an earlier silent film The Lodger: A Story of the London Fog (1927) starring Ivor Novello, which was one of Alfred Hitchcock’s earliest films, and this was given a sound remake as The Lodger (1932) also with Ivor Novello. Both works are adapted from The Lodger (1912), a novel by Marie Belloc Lowndes, a well-known writer of thrillers in the early parts of the century. Lowndes had based the book on a dinner party anecdote she had heard where someone claimed that they were certain that their lodger was Jack the Ripper. Unlike the novel, this version specifically identifies the killer as Jack the Ripper, a figure that Lowndes named only ‘The Avenger’. Hitchcock retained Lowndes’s description of the killer as The Avenger, although also added an ending where the lodger turns out not to be the killer after all. 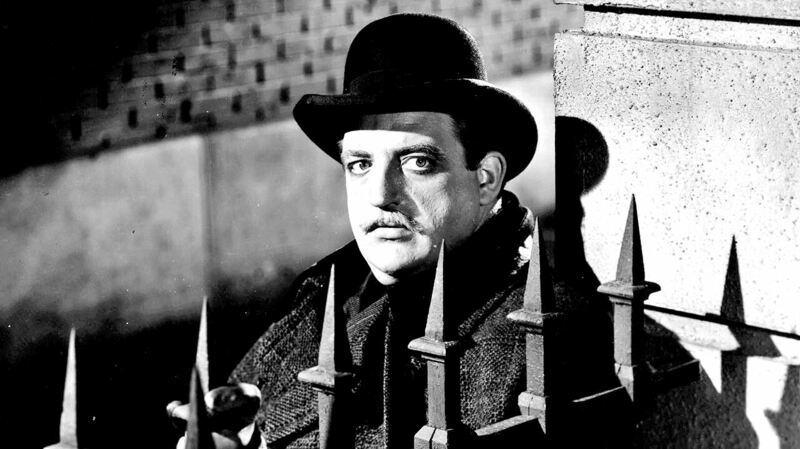 The Lodger briefly made the career of big man Laird Cregar, who after this seemed on the verge of becoming another Sydney Greenstreet, but died of a heart-attack the following year at the very point of his success. The Lodger was directed by John Brahm, a German immigrant who had made a few routine crime melodramas and war films and the not-so-well known werewolf film The Undying Monster (1942). Brahm went onto make Hangover Square (1945), also with Laird Cregar, an attempt to repeat the success of The Lodger, and the dreary The Mad Magician (1954) with Vincent Price, but The Lodger was his greatest success. All three of John Brahm’s films are psycho-thrillers that contain a grandly pre-Psycho (1960) vision of melodramatic psychopathology. Brahm also contributed a number of classic episodes to the original The Twilight Zone (1959-63) and was one of the uncredited directors on the lost world film Siren of Atlantis (1948). One has not read the Marie Belloc Lowndes novel but one suspects it is more an ambiguity drama set around whether the Lodger is The Avenger/Jack the Ripper. However, no such ambiguity exists in the film. 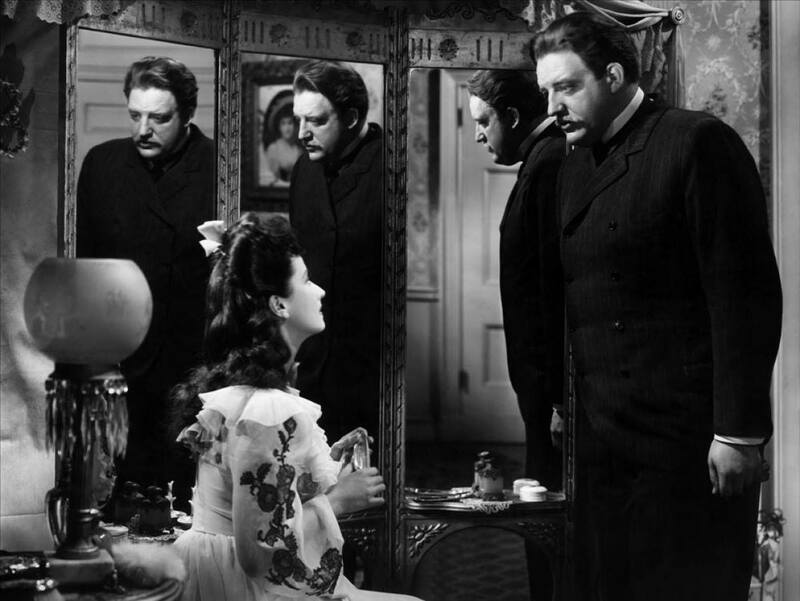 While it is there in the script to some extent, directorially the film is all weighed toward painting Laird Cregar as a sinister figure – his face is always underlit, reflected in mirrors or seen looming in the foreground. Not to mention the ways he starts talking with an unnatural intensity about his brother and the river. By the end of the story, Laird Cregar has become such a melodramatically unbalanced figure that he is like a feral animal – wild-eyed, hunched over and shot as though he is backed into a corner. It is all rather entertaining, although as a Jack the Ripper story it is factually shaky to the point of being pure fiction. The Ripper victims here have different names to the actual ones. Most amusing is the bowdlerization of what types of people the victims were – they having gone from being the prostitutes they were historically to now dancehall girls, a considerable dignification of their status that the Hays Code must have enforced. Moreover, the psychology of the era, which was informed more by Gothic melodrama and little real psychological motivation, is cod. Laird Cregar kills dancehall girls, it appears, because one of them morally dragged his brother down. The real Jack the Ripper was not operating on a screwy notion of revenge but someone who pathologically hated hookers to the point of gutting them and tearing out their innards. Other versions of the book are the obscure The Lodger/The Phantom Fiend (1932), a loose early sound variation of the story; Man in the Attic (1953) starring Jack Palance in the Laird Cregar role, which was a direct remake of this film; and The Lodger (2009) starring Alfred Molina and with Simon Baker as Slade, a modernized version set in Los Angeles. The other Jack the Ripper films include:- those that conduct supposedly straight tellings of the details of the case such as Jack the Ripper (1959), the Spanish Jack the Ripper of London (1971) with Paul Naschy, Jess Franco’s Jack the Ripper (1976) with Klaus Kinski, Jack the Ripper (tv mini-series, 1988) starring Michael Caine, The Ripper (1997) and the Alan Moore graphic novel adaptation From Hell (2001) with Johnny Depp or that feature The Ripper as a central character like Room to Let (1950), although most of these vary widely from the known details. More prevalent have been speculative treatments, including the likes of:- having the contemporary but fictional figure of Sherlock Holmes solve the mystery in A Study in Terror (1965) and Murder By Decree (1979); the Ripper being an alien spirit that possesses Scotty in Star Trek‘s Wolf in the Fold (1966) and with similar stories occurring in episodes of Kolchak: The Night Stalker (1974-5) and The Outer Limits (1995-2002); the Ripper being Dr Jekyll in both Dr Jekyll and Sister Hyde (1971) and Edge of Sanity (1989); Jack the Ripper’s daughter featuring in Hands of the Ripper (1971); H.G. Wells and the Ripper travelling through time to the present day in Time After Time (1979) and its tv series remake Time After Time (2017), as well as a time-travelling Ripper appearing in episodes of tv series like Fantasy Island (1977-84), Goodnight Sweetheart (1993-9) and Timecop (1997-8); The Ripper having travelled out West in the Knife in the Darkness (1968) episode of the Western Cimarron Strip (1967-8);The Ripper being resurrected or copycated in the present day in The Ripper (1985), Bridge Across Time (tv movie, 1986), Jack’s Back (1988), Ripper: Letter from Hell (2001), Bad Karma (2002), The Legend of Bloody Jack (2007) and Whitechapel (tv mini-series, 2009); a parody segment of Amazon Women on the Moon (1987) that speculates that the Ripper was in fact the Loch Ness Monster; the Babylon 5 episode Comes the Inquisitor (1995) that reveals the Ripper was taken up by aliens and redeemed; transposed to Gotham City in the animated Batman: Gotham By Gaslight (2018); even turning up as a character in the French animated film Jack and the Cuckoo-Clock Heart (2013). Also of interest is the tv series Ripper Street (2012– ), a detective series set in London in the immediate aftermath of the Ripper killings.